This is used to destroy the disposable or autodisable (AD) syringe after use. What is the purpose of using this? This is used to minimize needlestick injuries to prevent transmission of blood-borne infections such as Hepatitis B and HIV. In other words, this is used to improve injection safety. Name the relevant program under which it is used. 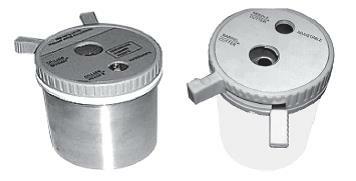 The needle and the hub of the syringe are inserted into the hole of the hub cutter. The syringe is held with one hand and the other hand is used to clamp the handles until the hub is completely cut and the needle falls into the container. How are the contents of the hub cutter disposed? •	Chemical treatment for 30 minutes (using at least 1% solution of sodium hypochlorite or freshly prepared bleach solution). This is done at a site designated for each health care center. GOI. Immunization Handbook for Medical Officers. New Delhi: Department of Health and Family Welfare; 2016.